Dear lord, it's come down to this! The Three Stooges are getting a second modern day reboot. Only this time, there is a twist! The Three Little Stooges will show everyone's favorite slapstick trio going on one of their first adventures. Yes, that's right. The Three Stooges is getting a Pre-Teen reboot. The search is currently on for three 12-year-old boys to play pint-sized versions of Larry, Moe and Curly. 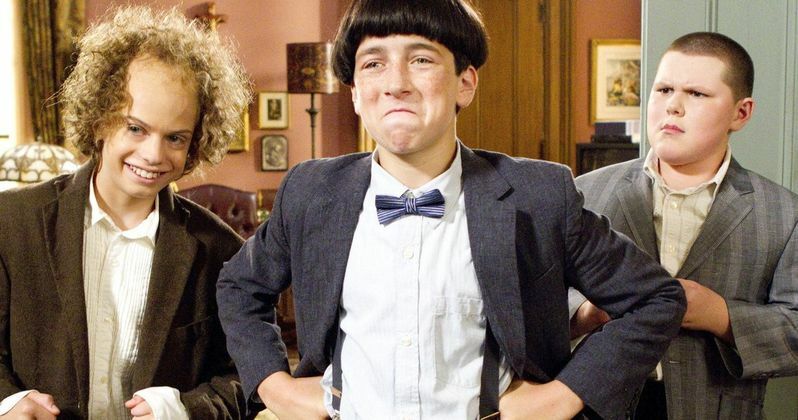 The movie is coming from C3 Entertainment, who currently own The Three Little Stooges brand. C3 Entertainment worked with 20th Century Fox on their 2012 The Three Stooges reboot, which was directed by Bobby Farrelly and his brother Peter Farrelly. The new movie will arrive in North American theaters through ARC Entertainment, with The Exchange handling sales at the EFM next week. Deuce Bigalow: Male Gigolo writer Harris Goldberg is behind the screenplay for The Three Little Stooges. He is also attached to direct. At this time, no plot details have been released for the comedy. This will not be an origin story. We got that in the Farrelly's The Three Stooges. This will instead be an original tale for family audiences that tracks the Stooges on one of their earliest outings. The hope is to build a Three Little Stooges franchise. Shooting will take place this summer in Vancouver. Casting director Joey Paul Jensen is ready to scour the countryside looking for these young Stooges. This will be completely different from the already announced The Three Stooges 2, which is a sequel to the 2012 reboot. C3 is also behind this follow-up, which is currently in development. Cameron Fay is writing that script. Earl and Robert Benjamin are producing The Three Little Stooges for C3. ARC CEO Trevor Drinkwater and The Exchange CEO Brian O'Shea will also produce. C3 Entertainment also promise that there will also be merchandising and promotional tie-ins for this family-friendly reboot timed to its release. What do you think? Are you ready for pre-teen stooges?